Last summer, the Berwick 900 Our Families family history research project set up a small creative writing group to write fictional family stories about incidents and historical characters in Berwick’s, Tweedmouth’s and Spittal’s history, using research produced by the volunteers. There's lots of scope for imagining what led up to incidents, what impact it had on people, what happened afterwards and creating a family story. One story, a poem written by Sandra Whitnell, is about a woman murdered at Middle Ord, Northumberland, in December 1876. 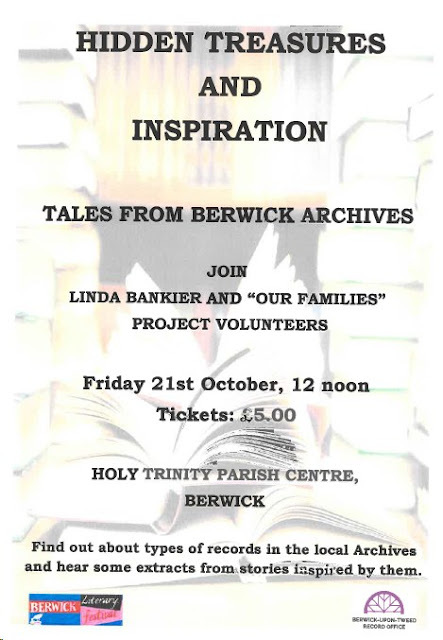 This year, Linda Bankier, the Berwick Archivist will give a talk at Berwick Literary Festival about the variety of records available in Berwick Record Office, and the audience will hear excerpts from three stories based on research into the Berwick Town Council account books, a newspaper cutting from November 1863 about a crinoline that caused an accident and a poster. The talk is on Friday, 21st October at 12 noon at the Holy Trinity Parish Centre, Berwick; cost £5.